Part 2 of 2 (Lester Holt, Bruce Brown, Lee Bollinger, Marty Baron, Alberto Ibargüen, Eric Newton, Mark Fainaru-Wada, Lance Williams, Eve Burton). 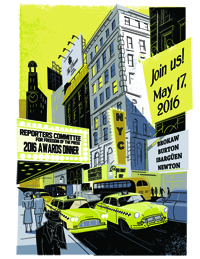 Coming Soon: Photos and live drawings from the 2016 Freedom of the Press Awards Dinner. Above at left, Tom Brokaw of NBC News receives the Fred Graham Distinguished Service Award from “NBC Nightly News” Anchor Lester Holt. Tim Armstrong of AOL Inc.
Alberto Ibargüen and Eric Newton of the John S. and James L. Knight Foundation (l-r). Tables and tickets are now available for purchase. $75,000 Leadership Table(s) for 12. Includes premier seating and listing on all printed materials. $50,000 Benefactor Table(s) for 12. Includes premium seating and listing on all printed materials. $25,000 Patron Table(s) for 10. Includes priority seating and listing on all printed materials. $15,000 Sponsor Table(s) for 10. Includes preferred seating and listing on all printed materials. $10,000 Supporter Table(s) for 10. Includes prime seating and listing on all printed materials. $1,500 Subscriber Ticket(s) each. Includes select seating and listing on all printed materials. $1,000 Friend Ticket(s) each. Includes listing in program. A limited number are available. To pay online, please go to our secure donation page. Please indicate your level of support in both the donation and tickets sections. Also please be sure to note precisely how you would like to be recognized in the program and elsewhere. If paying by check, please it make payable to Reporters Committee for Freedom of the Press, and send with the completed RSVP form to Reporters Committee for Freedom of the Press, c/o Benefits Office, Inez Weinstein Special Events Inc., 215 Park Avenue South, Suite 2014, New York, NY 10003. Contributions are tax-deductible as provided by law. The non-deductible portion of each ticket is $215. 2014 First Amendment Awards Dinner honoring Sharon Percy Rockefeller, WETA; Carol Rosenberg, The Miami Herald; Bruce W. Sanford, BakerHostetler; and Arthur O. Sulzberger Jr., The New York Times. Dinner chairs were Donald A. Baer of Burson-Marsteller and Penn Schoen Berland, and Donald E. Graham of Graham Holdings Company. 2012 First Amendment Awards Dinner honoring Josh Gerstein of Politico, Brian Lamb of C-SPAN, and Barbara W. Wall of Gannett Co. Inc. Reporters Committee founding member Fred Graham was presented with the Distinguished Service Award, which was renamed in his honor. Dinner chairs were John Fahey of National Geographic and Katharine Weymouth of Washington Post Media. A list of all previous First Amendment Awards honorees, dating back to 1995, is online here.